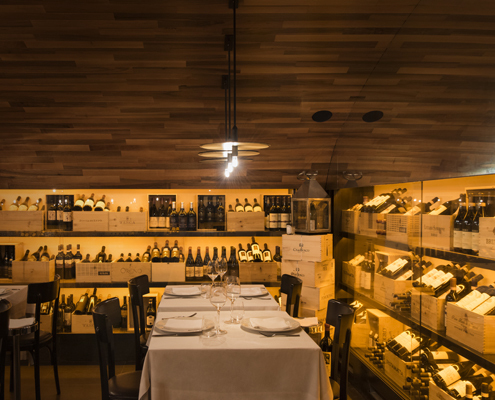 The Wine Cellar at PIERLUIGI RESTAURANT features over 1,500 labels, including many rare and exclusive vintages. We offer the finest Italian production, a selection of great French wine and Champagne and other excellent choices from around the world. In addition, there are the best of international distilled spirits and liqueurs. With a desire to satisfy the discerning tastes of an international clientele, Lorenzo Lisi selects an extensive variety of fine wine ranging from the traditional and classic to that of independent enologists, from experts who insist on maintaining the wine’s natural characteristics, to that produced at the world’s most prestigious Domaines and Chateaux. 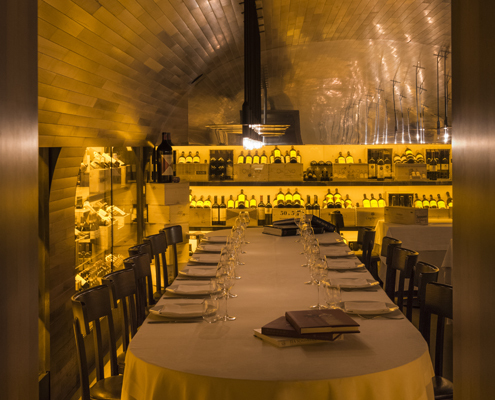 Among the vaults of the ancient cellars of the historic Piazza De’ Ricci, entirely covered in natural materials such as wood, volcanic stone and glass, the Wine Cellar at Pierluigi Restaurant is both innovative and traditional. A monument in evolution in its own right, it was developed, embracing the vision of owner Lorenzo Lisi and Chef Sommelier Alessandro Tibaldo. This vision, while modern in its movements, remains essential and functional in its form, with respect for the past, yet attentively projected towards the future. The architecture has rendered it a magic place, austere and at the same time, convivial and welcoming. Rich in atmosphere and history, the Wine Cellar is perfect for holding business meetings and reunions of international delegations. Heads of State, actors and other personalities who are searching for discretion, and fine wine and cuisine in a confidential and relaxed ambient, can comfortably enjoy exclusive dinners, memorable wine-tastings and inimitable events here. When required, we are fully able to provide the structural necessities for adequate national and international diplomatic security. The Wine Cellar is divided into two settings: the Principal Room and the Private Room. The larger Principal Room comfortably accomodates 36 people. At the center, there is an oval Imperial table with 22 seats, flanked by several smaller tables, suitable for 2 to 6 people. 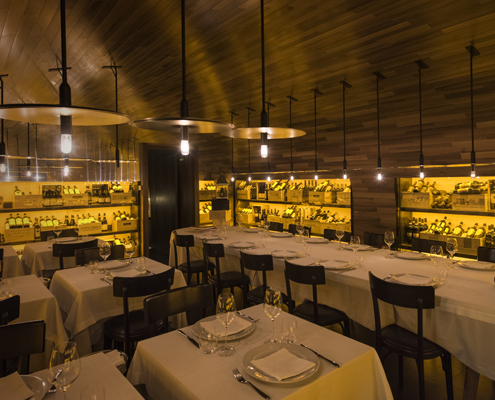 The Private Room, closed by a retractable door that can be opened only upon request, features comfortable leather armchairs and tables, ideal for savoring distilled spirits of the finest labels. These few words reflects how Chef Sommelier Alessandro Tibaldo talks about wine. Since 2008, he has been dividing his time between the Wine Cellar at Pierluigi Restaurant and auctions in Italy and other countries in Europe. Year after year, he continues to surprise clients with the excellence of an impeccable Wine List, in continuous evolution, where one can read an attentive, and meticulous research, to include a selection of wines from the best producers and vintages. The Wine Cellar containes more than 16,000 bottles from 220 producers, for a total of circa 1,500 labels coming from different nations, including those of the greatest Domaines and Chateaux in the world. Among these, are historic verticals from Chateau Mouton Rothchild, from 1970 until today and Krug Millesimi and R.D. Bollinger from 1988 until 2002. Much attention has been given to the Italian territories, in particular Tuscany and Piedmont. From these regions, our Wine Cellar counts historic verticals ranging from Brunello di Montalcino Biondi-Santo Riserva from 1961 until 2012 an Ornallaia, Solaia, Sassicaia and Gaja from the 1980’s until today, just to name a few. 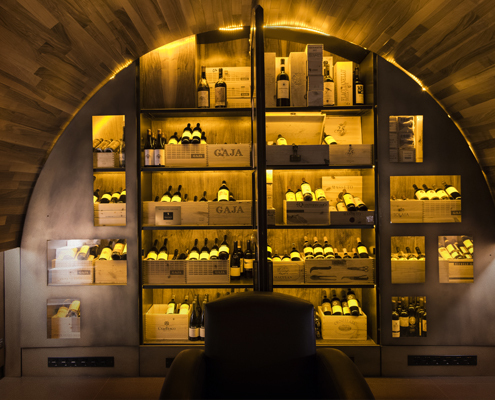 Due to such prestigious selections, our Wine Cellar has become an essential point of reference for many producers. Coravin is an innovative instrument which allows you to pour your favorite wine by the glass, without pulling the cork. With no oxidation, your wine can remain preserved for over a week, month and even longer. 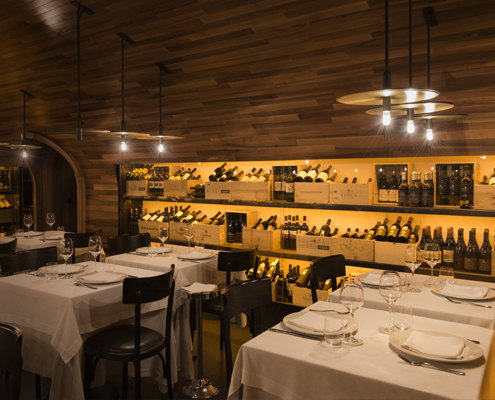 Pierluigi Restaurant has a selection of more than 20 fine wines that can be consumed with the Coravin. 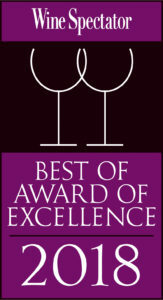 Please ask our Sommeliers for more information. The List of Distilled Spirits proposes rare and important international selections. Bas Armagnac, Cognac, Whisky and Rum, in addition to a prestigious labels of Sakè, distillates of grape and quality grappa, can be enjoyed, and even accompanied by preferred cigars made available to our Clients. Private rooms are available for Special Events upon request.